The Maiden’s Tower The Maiden’s Tower (Turkish: Kız Kulesi), built on a tiny island in the Bosphorus, has a history that goes back to 24 B.C.E and is the subject of many legends. The Maiden’s Tower (Turkish: Kız Kulesi), built on a tiny island in the Bosphorus, has a history that goes back to 24 B.C.E and is the subject of many legends. Over its history it has been used as a lighthouse, a quarantine hospital, and in many other capacities. Today it is possible to learn about the legends of the Maiden’s Tower from the Legends Exhibition housed on its grounds, open to visitors between 09:00-18:00. 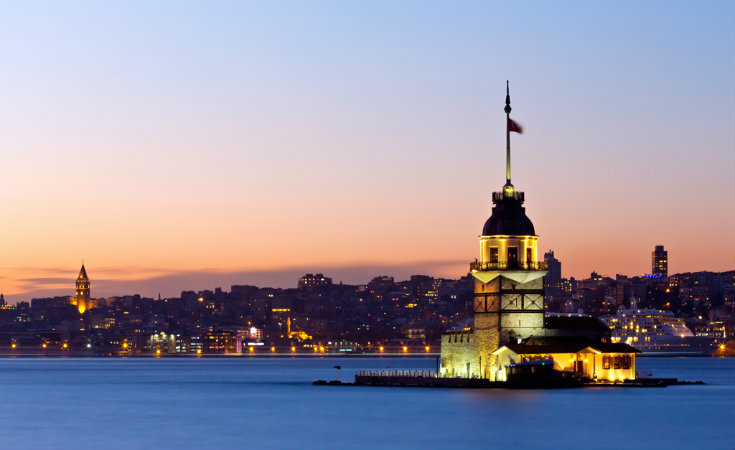 It is also home to the Maiden’s Tower Restaurant one of the most romantic restaurants in Istanbul where one can dine while listening to live music and enjoying a 360 degree view of the Bosphorus. One of the most important symbols of Istanbul, it is reported that the tower was built in 507 C.E in the time of the Emperor Lustinianos. Known in the past as the “Jesus Tower” and “The Big Tower,” it attained its current appearance after work done by the Genoese. In 1638 Hezarfen Ahmet Çelebi is known to have flown from this spot across the Bosphorus after putting on artificial wings. The tower is open to visits between 09:00-19:00 and in the Galata Tower Restaurant one can dine and enjoy a magical view of Istanbul while watching an authentic Turkish Show. The Beyazıt Tower (Turkish: Beyazıt Kulesi) was first built out of wood in 1749, with the goal of serving as a watchtower for fires in the city. Burnt down in the 1756 Cibali fire, it was rebuilt by Mahmut II. After being destroyed again in the Yeniçeri uprising, the historical tower was built again under the architectural direction of Senekerim Balyan in 1828. Arriving at its current form in 1849, its height together with the additional towers is 118 meters. Used as both a fire lookout tower and a weather station during the Republican period, today it is found on the central campus of Istanbul University. As an enduring symbol of Istanbul, in 2010 the tower was fitted with LED lighting technology in order to illuminate the structure at night when the city was the European Capital of Culture. It continues to serve as a weather station for Istanbulites.